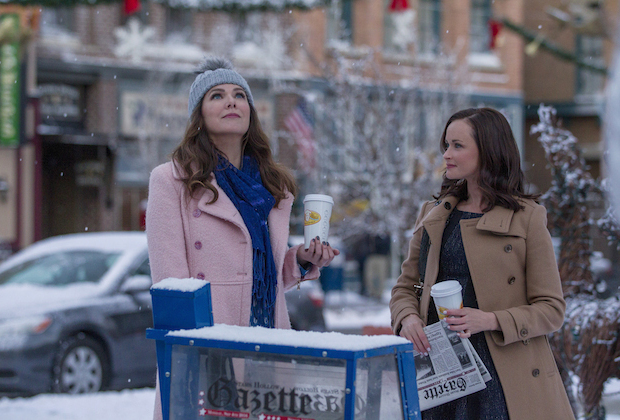 Warning: Gilmore Girls: A Year in the Life spoilers ahead. Yes, we stayed up until 6 a.m. marathoning all four mini-movies straight. There was lots of coffee and snacks involved. And now that it's all done (I'm debating whether a re-watch is necessary for any deeper analysis right now, but I'm also very sleepy), yes – I have thoughts. But rather than wait until I decide to re-watch it all now or not, I wanted to jot down some initial reactions because posting anything on social media right now is cruel and I don't want to accidentally spoil anything for anyone. So, this post has spoilers. Seriously. Last chance to duck out. While it would've been smarter for me to jot stuff down while watching, I wanted to focus on the viewing experience of an early '00s WB show, so I had nothing in hand. Kelly freakin' Bishop. Seriously. The fact that she was never recognized during the original run with any awards for this role is a shame. I found myself throughout A Year in the Life wanting to see more and more of Emily Gilmore (and her in therapy), and I kind of love that she became a museum docent at the end. 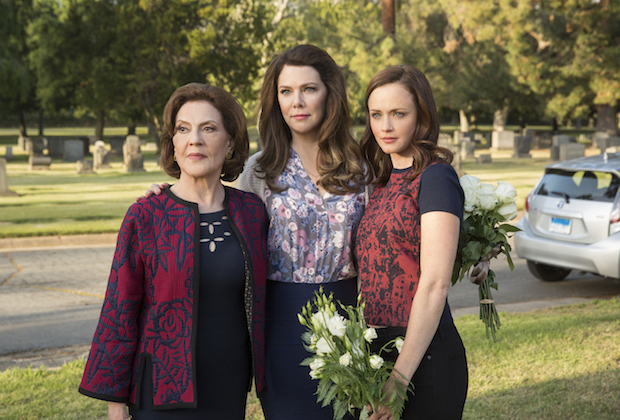 Everything about her storyline was perfect, from the arguments with Lorelai to just the look on her face at the cemetery. I've always loved Sam Phillips's "Reflecting Light," so its reappearance at the end during the pre-wedding sequence was fitting and wonderful. And the decorations really were beautiful. While I had issues with how extravagant some of the scenes were (hello, Netflix budget), every twinkle light in the town was spot on. The townies have always had the best storylines, and I think we were served some of the quirkiest ones in the best doses in A Year in the Life. Any more Kirk gags would've felt old (I was hesitant on the Ooo-ber thing at first, but it was pretty funny), and all of the one-liners and old traditions (Town meeting! Off-beat festivals!) written in the show's intended voice made me nostalgic for seasons 1-4. Also, giving Michel a love life (finally!) was a nice bonus. This is kind of going off of #2, but: the music. From the "la la's" to the small Carole King solo, and some well-known songs tossed in (all I could think about was licensing fees though, to be honest... that Beatles sequence, hello), everything about the production felt just...right. And that's something I think fans were missing all through season 7. But A Year in the Life captures not just the look and the dialogue, but the feeling of what made Gilmore Girls so unique. Also, Stars Hollow: A Musical could've played terribly, but the audience's vs Lorelai's reactions, plus Sutton Foster's pure presence, made it one of the funniest bits. As sad as it is to see Paris and Doyle at war, I did love seeing Paris as an exhausted but overwhelmingly successful adult who also still gets anxious at the sight of (a non-Chad Michael Murray) Tristan DuGray. If anyone in Gilmore world was going to be a badass, it's only fitting it'd be Paris, who found a profession that lets her be on top of the world while also judgmental enough for audiences to say, "There's the Paris we know and love." Rory really is a terrible journalist. I hate the "journalists always sleep with their sources" trope, but there it was in "Spring." 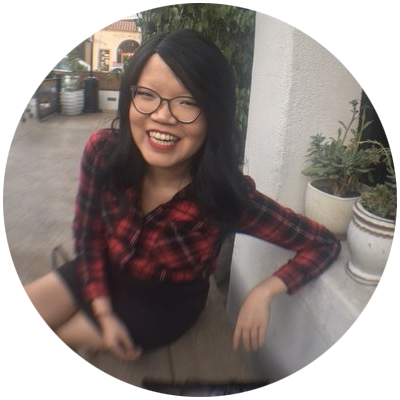 I'm almost glad she didn't end up pursuing journalism, even though I was rooting for her to be a kickass one in the original run (and if you really know me, you know that one of the reasons I became interested in journalism in high school was because of Rory Gilmore). Lorelai Gilmore would never "do Wild." At least, not the Lorelai Gilmore we came to really know and love between 2000 and 2007. I hated that whole storyline because it felt like an even bigger distraction from the plot than the tango sequence with the Life and Death Brigade (see point below), and it's also cliche as hell. The return of the Life and Death Brigade. Maybe it's the larger budget, or the fact that they were trying to bring back all of the fun and favorites of the original run, but that whole extended scene set to "With a Little Help from My Friends" was too over-the-top for my liking, as pretty as the cinematography is. That was one of the few scenes I found myself wanting to check the time to see how much was left of the episode. Rory declared all over the place that she was writing a book, and I assume Jess is publishing it or else why would she be so certain she's going to be an author? Because it's not easy, but then again, the world of Gilmore Girls has always wanted you to think Rory is a wunderkind. Anyways, her writing the book of the thing we've been watching for years is such a "meh" plot. I feel like when shows like 30 Rock do it, it makes sense because they were tying a bow on the whole thing, but A Year in the Life certainly didn't feel like a bow on anything. The whole "drop the 'the' and just call it Gilmore Girls" thing felt cheap. I definitely wasn't expecting a Roy Choi name drop and cameo in the first episode. I kind of enjoyed the parade of chefs through the kitchen, which was probably the best way to address Sookie's prolonged absence. The running "Paul" gag was kind of funny, although it just kept further cementing the "Rory Gilmore is a terrible person" notion. Characters we needed more of: Paris, Lane (seriously, give the girl a break), JESS; characters we didn't need more of: Logan. The Secret Bar is the perfect addition to Stars Hollow. Sutton Foster is a goddess. The cameos were fun and not in-your-face. I was worried some of the appearances would feel like they've overstayed their welcome or would be too wink, wink, isn't this interesting and funny (I'm looking at you, Fuller House). The first thing I said out loud in the whole night of watching was when Jason Stiles popped back on screen during Richard's funeral/wake: "Hey, he came out of the bathroom!" True GG fans know what I'm talking about. It was predictable Rory would volunteer as editor of the Stars Hollow Gazette, and I don't know...I could write a whole blog post on the arc of Rory's career as a "journalist" and how frustrating it was to watch her throughout Yale and then see her try and float of the glory of one New Yorker article at 32. I get that the business is hard, but AS-P definitely makes journalism look and feel like a worn tire, which was not the feeling we were getting in the original run. I've always been Team April, and after "Summer," I love her even more, and I'll fight you all on this. Something that was nice about the four-episode recurrence of Berta and her family: it provided stability for Emily at a time when life was incredibly unstable. That was a nice touch. How is Rory affording the back-and-forth flights to London? It's not like she's got a company expense account, unless she inherited a sum of money from Richard and is just using it to sleep with an engaged man. I really didn't like Rory in A Year in the Life. It feels like the show really wants you to root for her, but this just felt like entitled and coddled season 6 Rory all over again. Spring – The beginning of therapy sessions for Lorelai and Emily, Paris scaring Chilton kids, an International Food Festival with only a handful of countries represented...the episode was not without flaws, but it sure felt pretty classic. Winter – Despite kicking off to a bit of a slow start and reintroducing us to Logan, Kelly Bishop had some of her best scenes in this episode, especially while wearing jeans. Also, the Hep Alien reunion! That's something the series also needed more of. Fall – There were a lot of things I didn't like about this episode I already documented above (the Wild thing and the return of the Life and Death Brigade), but seeing Melissa McCarthy back in the Dragonfly Inn helped bring up the mood. Plus, Lorelai telling Emily about her favorite Richard memory, Emily moving to Nantucket, the pre-wedding wedding...that saved (some of) the 90 minutes. Summer – As fun as the musical was, Rory was the most annoying in this episode, and for that, it hits bottom for me. Also, Lorelai and Rory at the pool with those two kids as their slaves was a reminder of how privileged and annoying the two can be. I didn't love A Year in the Life, I'll be honest. If I were to rank it in between the 7 seasons of the original run, it would fall somewhere near the bottom (still better than season 7, and probably most of 6, to be honest). But I really did enjoy watching these four mini-movies, especially seeing and hearing it from AS-P's point of view again. Now, I need another nap (or a giant cup of coffee).